Want to spice up your long hair a little bit? Do you feel like it’s gotten boring, or starting to sit a little flat? Long layered haircuts are an excellent choice to bring volume, and to change things up without necessarily going short. 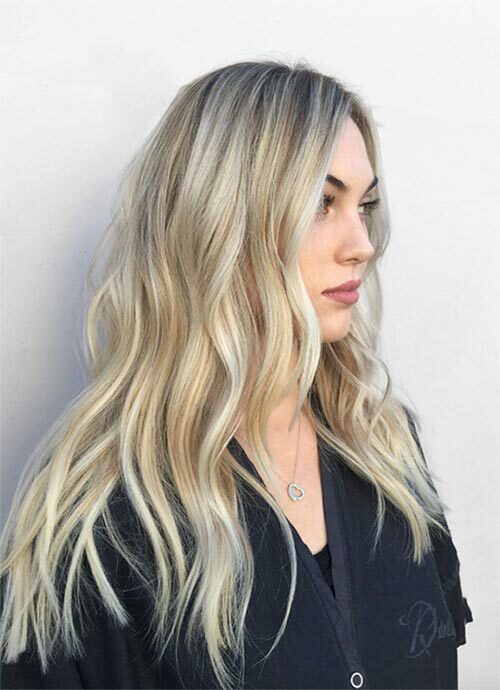 Layered haircuts and hairstyles for long hair are perfection ” they work so well with trendy hair colors and balayages, and they are blissfully easy to style. Which of the Long Layered Haircuts Is Right for You? There are a few excellent options for long layered haircuts, and the one you choose depends a little bit on your face shape, and a lot more about your style and preferences. Don’t worry; I’m here to break it all down for you! Starting the layering just above the chin is the best choice for anyone who wants to highlight their features, or who feels like they need a bit of structure. The layers can also be swept aside, and provide a side-swept bang effect. This is the best layered haircut for anyone with a longer face shape. This can be a big change if you are transitioning from solidly straight hair, and it might not be the best choice for those with round faces. Starting the layers below the chin or just above the shoulders, and letting them get progressively longer, portrays a gorgeous, and refreshing image. It is a very clean way of layering the hair, and it flatters everyone. On the other hand, if you want to play with texture and volume, and want long layered hair that is a little more wild, then having shorter, shoulder-length layers all around the crown, to break up the monotony, is an excellent choice. This makes the hair look much thicker and fuller at the shoulder, and is super fun and interesting. Last way of doing it is perfect if you are a little nervous about layering your hair. Keep the layers to the ends, so they can create interesting and voluminous ends, without ever taking away from your length. What About Styling Layered Hair? The beautiful thing about layered haircuts for long hair is that they play really well with almost all kinds of styling. 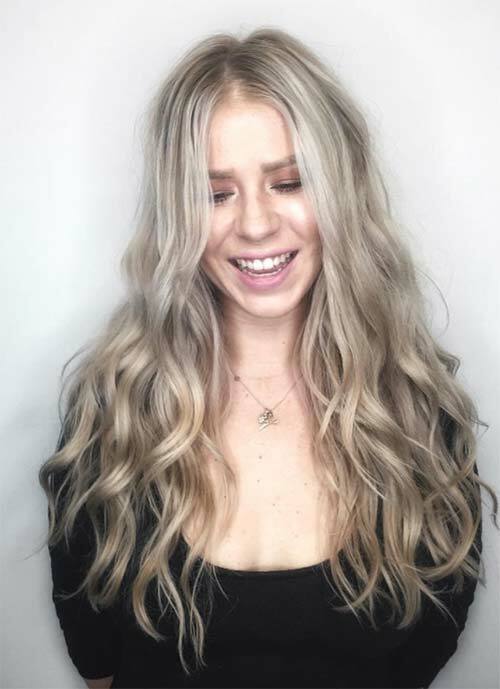 Waves and curls are the go-to hairstyling choice for most long-haired babes these days, and they pair extremely well with all kinds of layers. Straightening the hair can look extra edgy, and it is less forgiving if you haven’t had an excellent stylist cut your hair. However, if you are careful choosing your salon, you are 100% safe. As far as updos go, long layered haircuts can make things a little more complicated. If the layers are small and subtle, reserved for the ends, it shouldn’t be an issue. Ditto for graduated layering ” you can just brush the face-framing layers off to the side, or pin them. However, a lot of the volume-building shoulder-length layers can make both ponytails and fancy updos difficult. Keep this in mind if you have a big occasion that will require an updo coming up. Do you think you know how you want your hair styled? Or maybe you would like a combination of a few different layers? 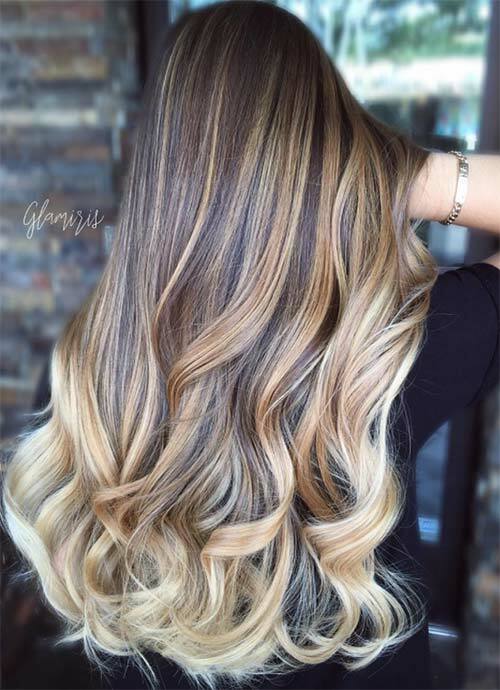 Well, we’ve got more inspiration coming your way, with a ton of incredible pictures of long layered hairstyles! In this long layered hair, the layers were kept to the bottom, allowing for the dark hair to flow beautifully. The textured layers at the ends were brought out thanks to a touch of auburn balayage. To perfectly frame the face without losing the long layered hair effect, layers were cut right above the shoulder near the front. Additional layers were done along the edges, and beautifully complemented the dark brown to platinum blonde gradient. Nothing complements layered hairstyles for long hair better than gorgeous curls that make everything blend together seamlessly. 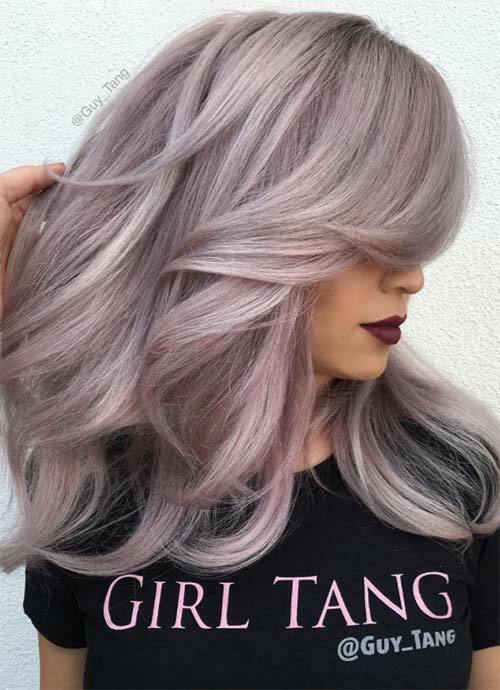 In this style by Guy Tang, everything is amplified by the gorgeous lavender and silver dye job. 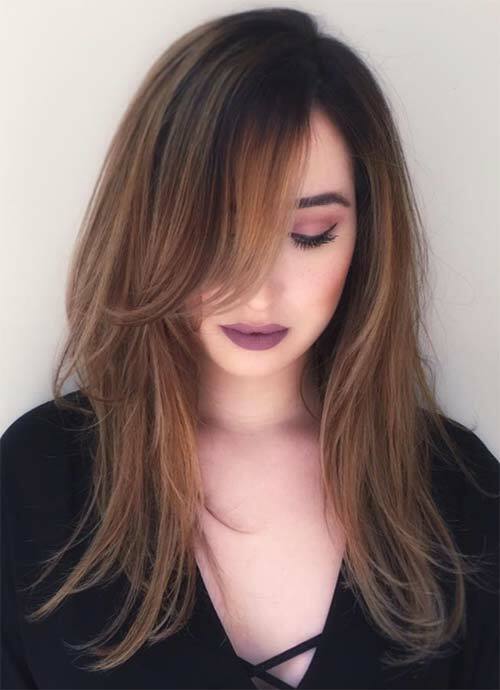 Another way of doing layered haircuts for long hair is to gradually cut the layers so that from the front to the back there is a bit of an angle, like in this look. 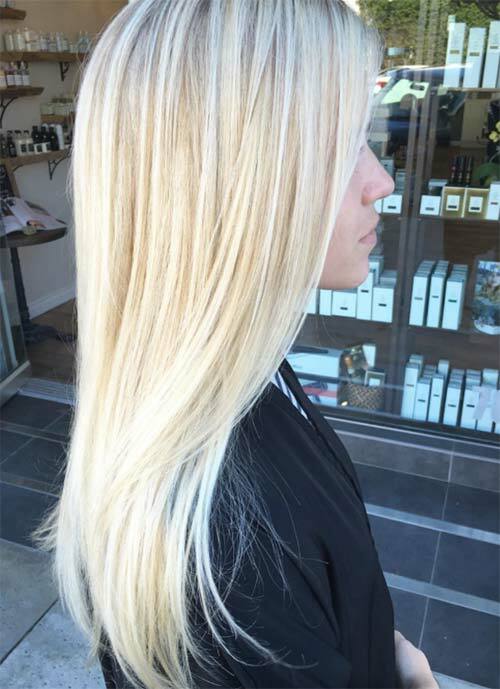 The layers are accentuated by a gorgeous ash blonde and platinum balayage, and piecey waves. Richly dark hair can be made to seem even more lush and luxurious thanks to long layered hairstyles, like in this case. Shorter layers near the front add shape to the face, while longer layers along the sides and back create texture and interest. 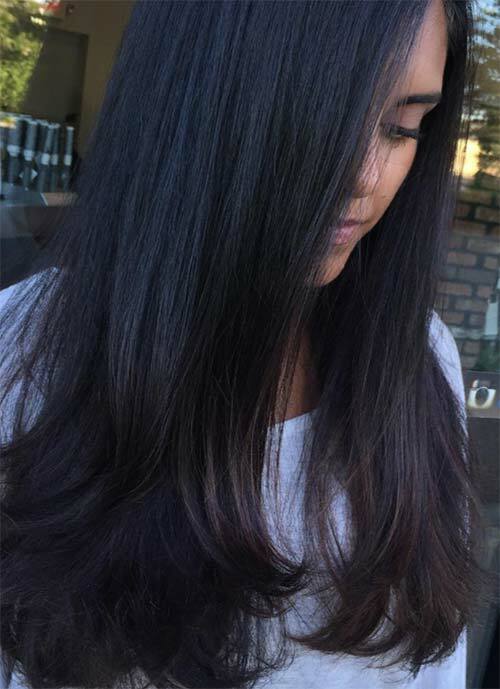 Layered haircuts for long hair work to amplify balayages, since both are techniques that create the appearance of volume in the hair. 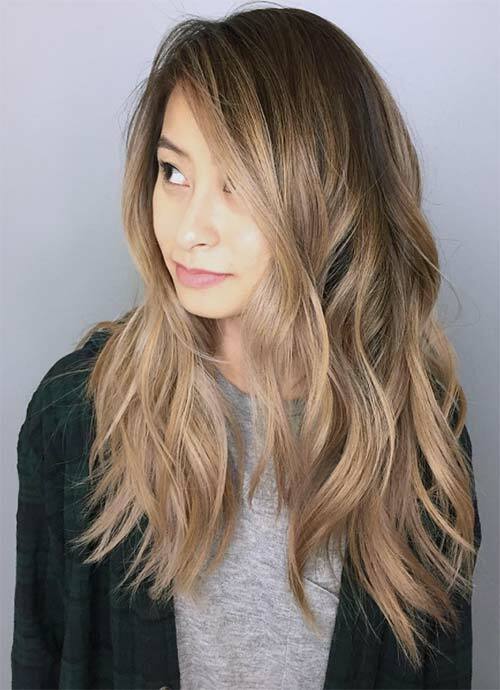 In this style, the shortest layers are still quite long, sitting just above the shoulders, and the copper balayage was interestingly kept off of the crown. 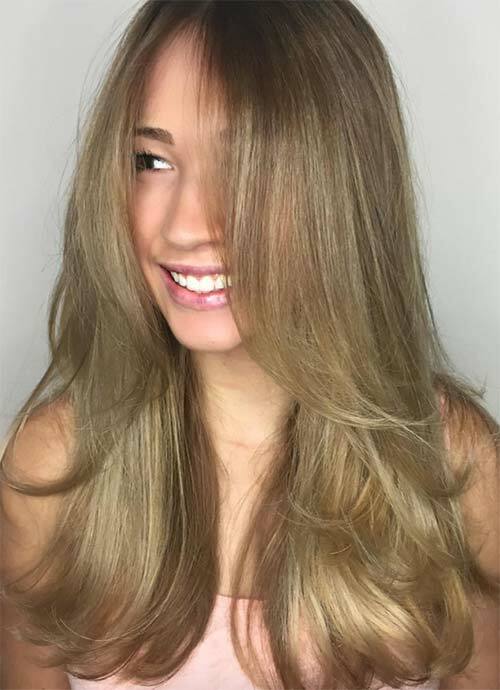 One of the softer long layered hairstyles is achieved by blow-drying the layered ends of the hair outwards, so that most of the volume remains near the bottom. 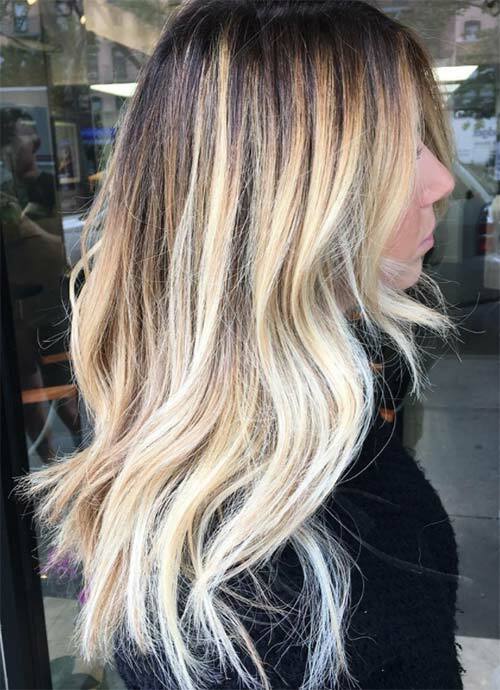 In this look, this styling cheekily shows off the warmer parts of the blonde balayage. Beautiful shades of copper and mahogany come together in long layered hair. The layers start just below the shoulders, so they really draw attention to the beautiful length of the hair. This is an excellent example of how well fiercely layered long haircuts can go with extreme hair painting. 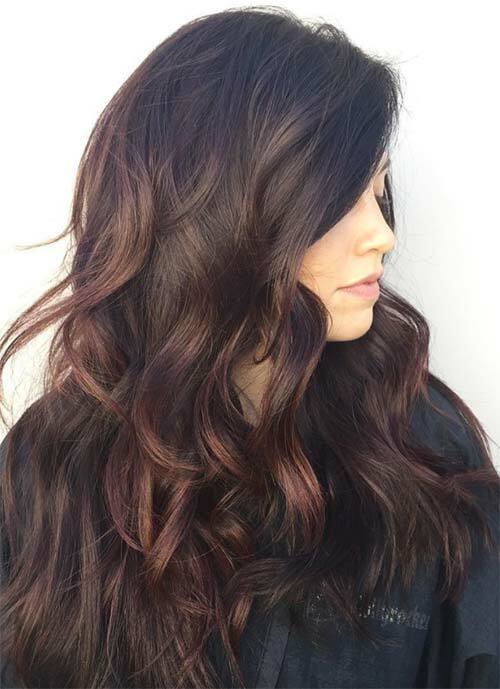 The curled layers really manage to show off this fierce blend of purples and pale browns. This subtle teal balayage with brown ends really calls to mind a raft peacefully floating through the ocean, while the curled layers at the end help to represent the waves. Long layered haircuts can also look incredible when given a simple blow dry, like in this style. 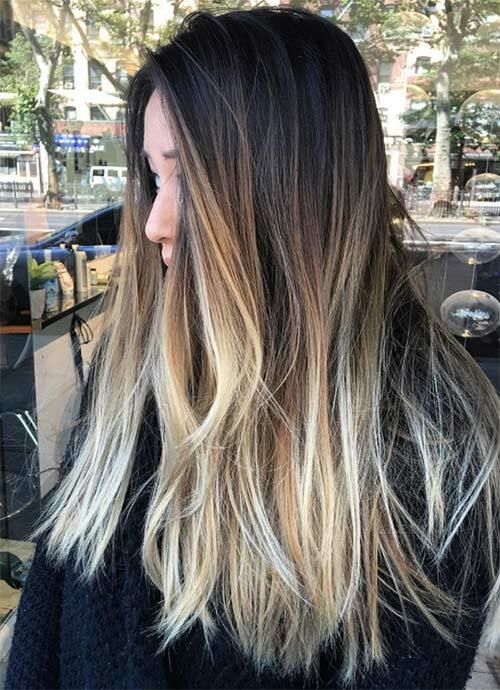 Thanks to the deep contrast between the balayage and the lowlights, even the subtle wave near the end seemed voluminous. 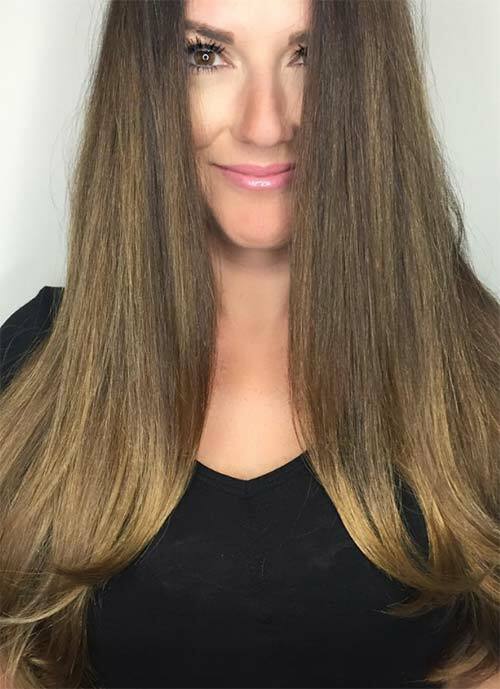 This is one of the more clever ways an expert colorist can utilize long layered haircuts. 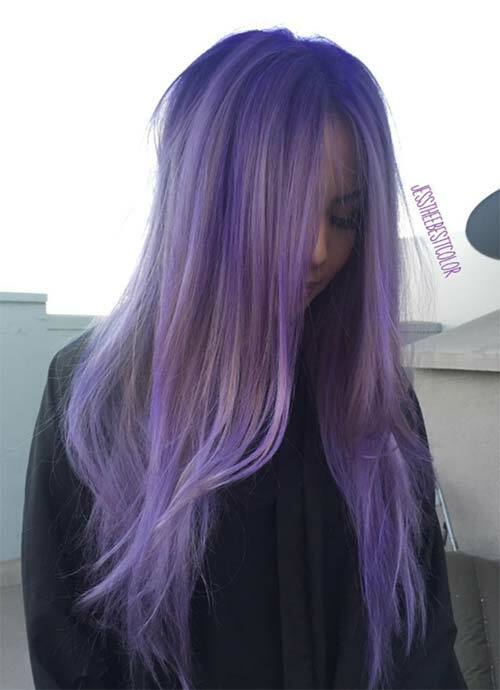 The hair was dyed in such a way so that under each new layer of hair, a different color would stand out, creating an attention-grabbing multi-color effect in metallic shades of purple. 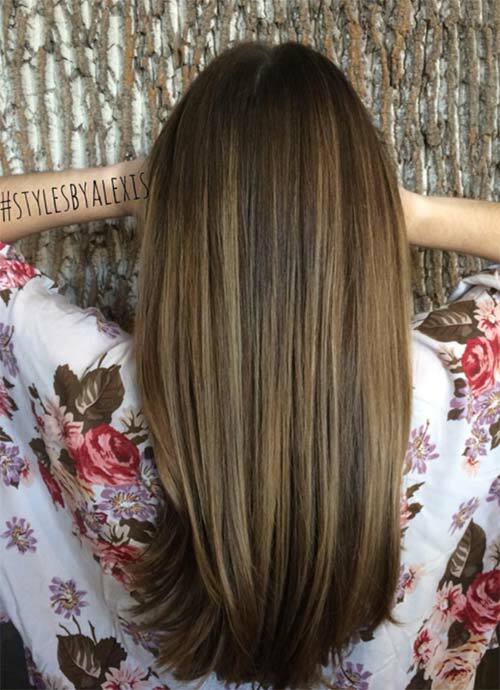 The layers in this dark brown to blonde balayage start right at the shoulder. Thanks to an expert blowout, long layered hair can seem to cascade down in a dramatic effect. 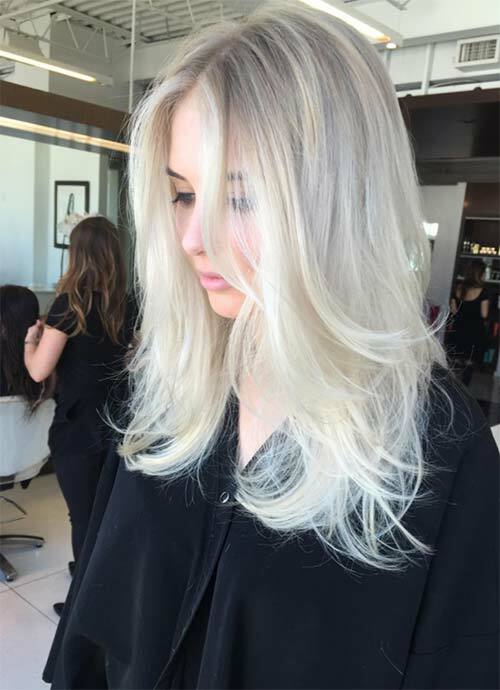 Dark brown contrasts nicely with platinum blonde, especially in layered long haircuts. A bit of face-framing layers near the front add structure, while step layers near the ends add a lot of volume. For the perfect princess haircut, ultra long layered haircuts are the key! The length and dirty blonde locks ensure you’ll look dainty, while many curled layers will make sure you look voluminous and astounding. 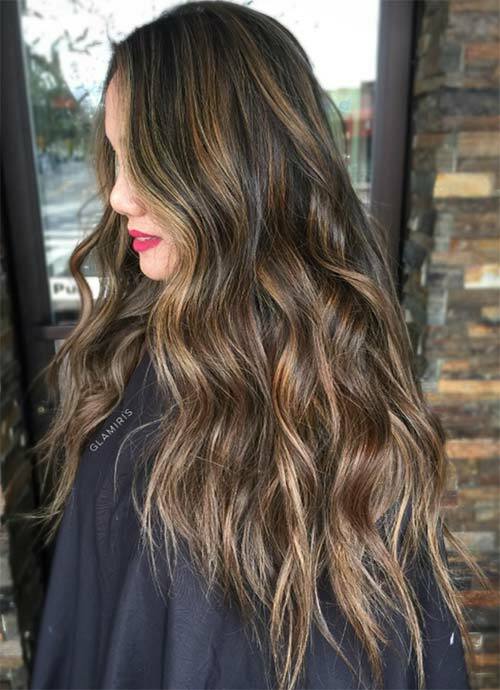 There are long layered hairstyles that can really play up the uniqueness of a balayage. 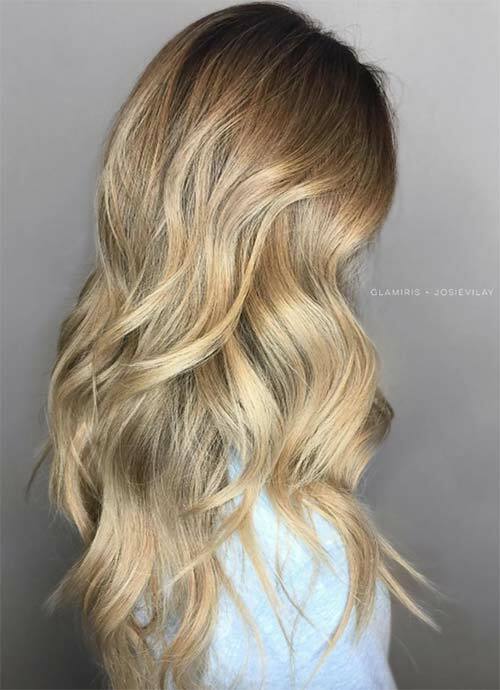 In this case, the dark roots end right on the first layer, near the chin, and the beachy lower layers are all about that blonde, emphasizing the two-tone effect. If you want to go on the abrupt long layered haircuts route, your dye job better be bangin’. 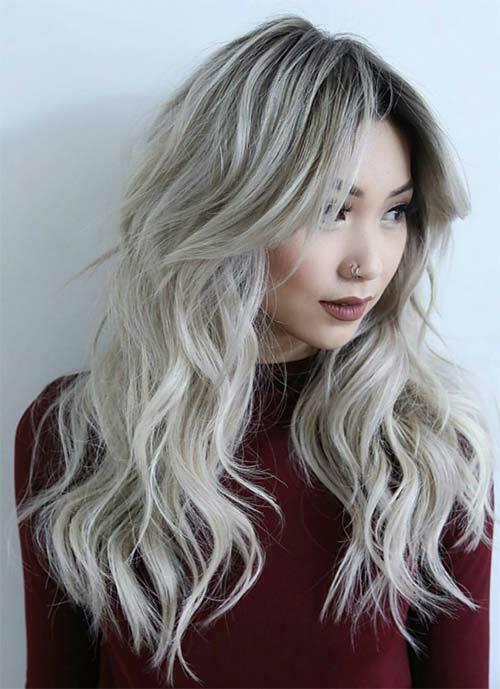 In this look the strands near the face look as though they have been chopped abruptly, but thanks to warm brown and blonde streaks this looks edgy rather than messy. You can add a touch of whimsy to long layered hairstyles, but highlighting only the edges where the layers start. 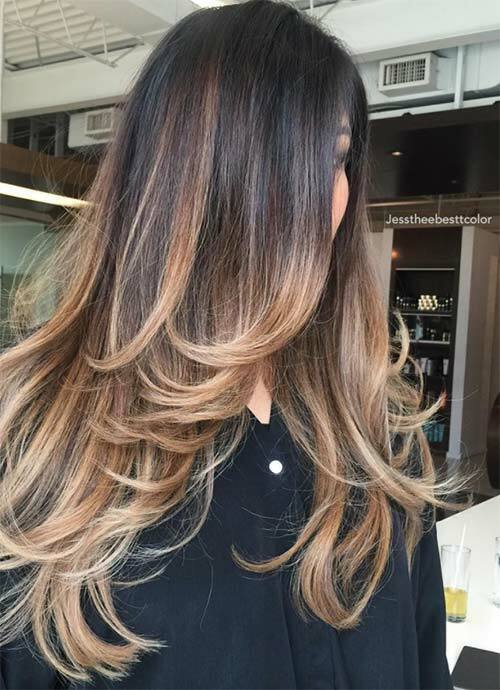 Here the effect is beautiful on brown-black hair, with warm blonde layers that start right below the shoulder. The excellent thing about long layered haircuts is that they can provide a lot of wispy charm to straightened hair. In this case, the model’s brown hair looks feathery soft and breezy thanks to layers that start right at the shoulders. Super clean long layered hair on this model looks dynamite thanks to her fiery red coloring. Sleek styling shows off that layers can also look very clean and subdued. 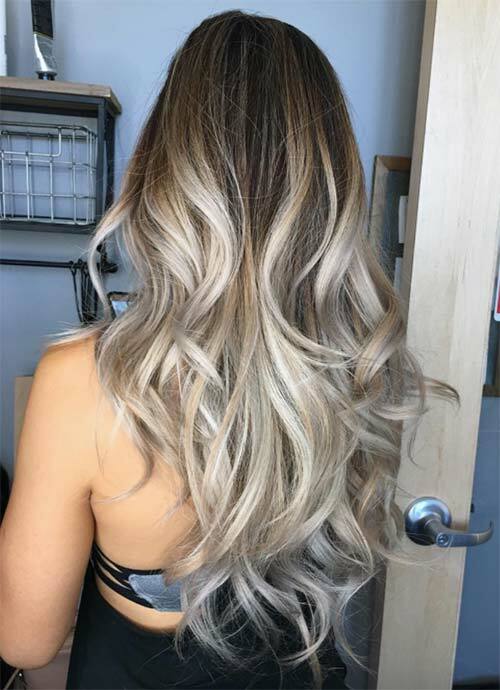 These platinum layered ends look especially wispy, which allows them to contrast nicely with the darker streaks near the crown. 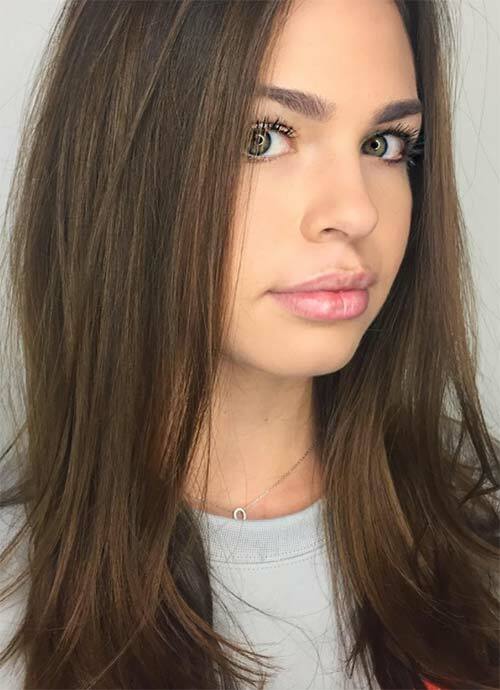 Thanks to a touch more volume and shorter layers near the face, long layered haircuts like this one can be ultra flattering on all face shapes. The delicate layering, when combined with velvety soft curls, works to create an especially romantic effect. 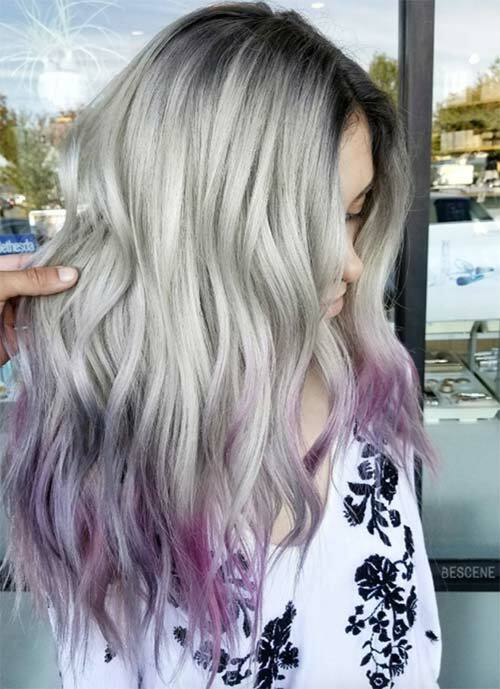 Lavender and gold hair color shades amp up the effect double fold. 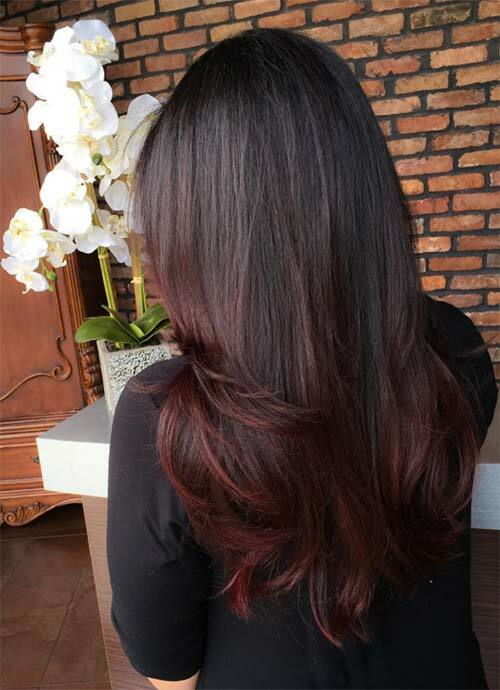 A wash of dark red along the ends of this long layered hair brightens and deepens this gorgeous cut. This is an example of how modern and flattering layered hairstyles can be. 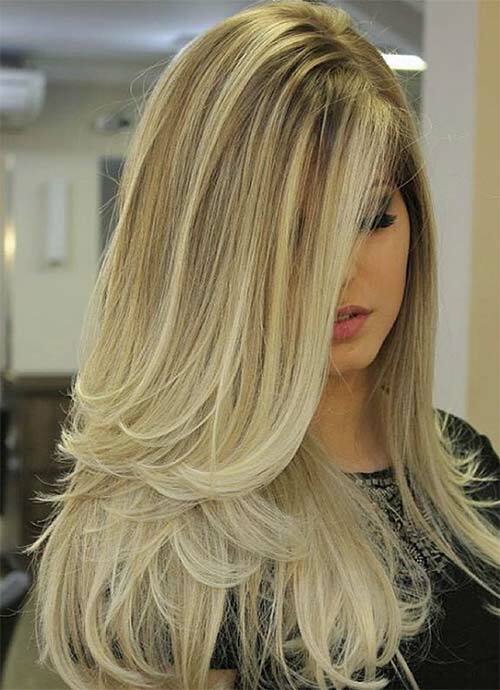 The most gorgeous hair, especially when it comes to long layered haircuts, is always healthy and shiney. 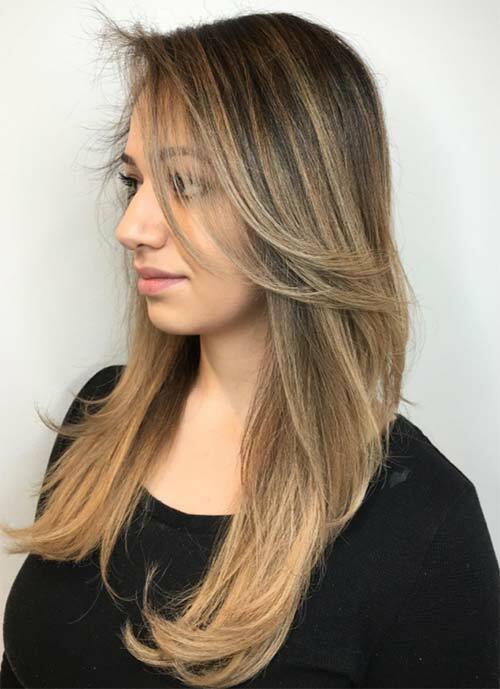 In this look we saw delightfully sleek brown to blonde balayage with soft waves, and clean layers just below the shoulders. This look is an impossibly bright example of straightened long layered hairstyles. The layers near the front of the face are the shortest, falling right below the chin, and they get progressively longer the further away they get from the face, creating a lovely cascade of hair. Much like the previous cut, the layers start shorter near the face, and get progressively longer. However, because of the wavy styling, the effect is subtler, and instead we get a lot of volume. 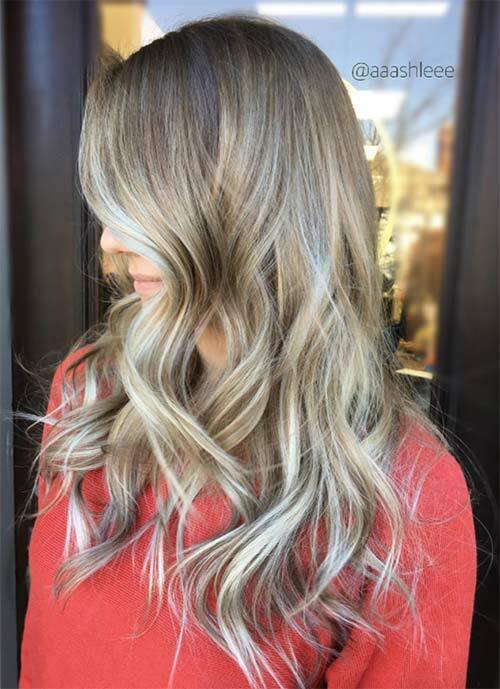 Dark black and ash blonde blend really beautifully in this style. Copper and dark mahogany shades are an excellent combination that has a lot of depth. Here this long layered hair works beautifully with soft waves, and layers that start just at the shoulder. 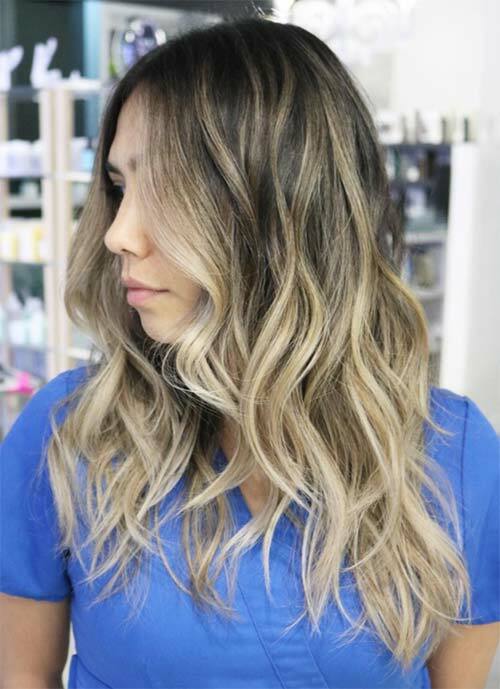 The dark brown and blonde balayage is a classic choice for long layered haircuts, even if the layers are not too extreme, starting just below the shoulder. 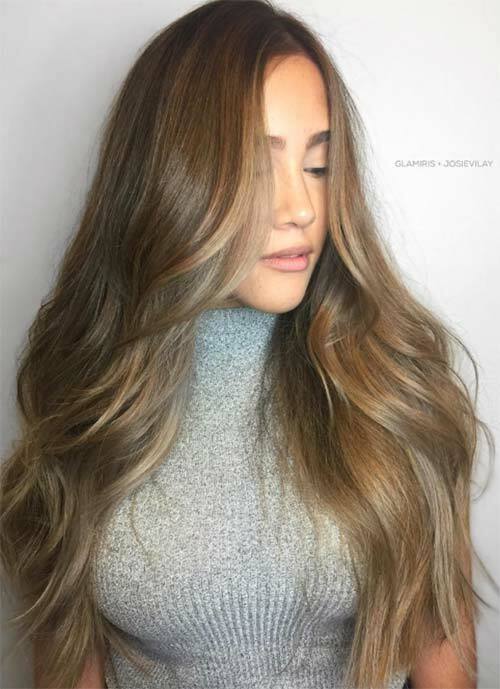 The mixture of long and short layers in this long layered hair is a little more extreme, and pairs beautifully with this mixture of caramel, blonde, and brown shades. Perfect waves, when paired with a super warm shade of gold, are absolutely perfect for long layered hairstyles. The layers start quite low here, a fair bit below the shoulder, which really adds to the classic blonde princess look. Layers don’t have to take away from extreme length, in long layered haircuts. 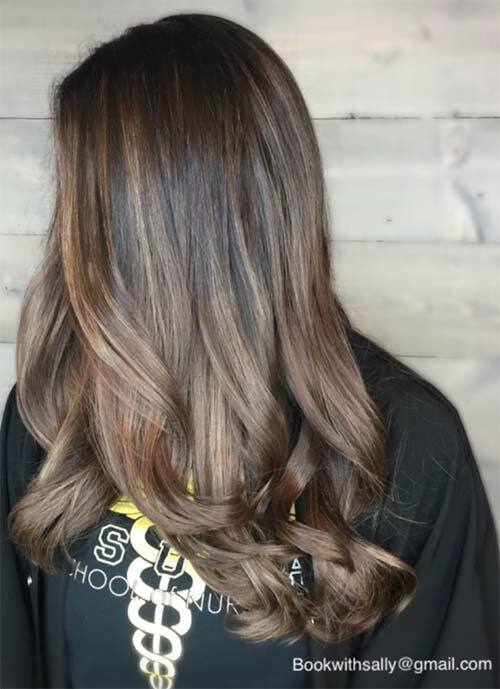 These gorgeous chocolate locks start being layered a fair bit below the shoulder, making the hair lighter and more manageable, and adding a touch of structure at the end. 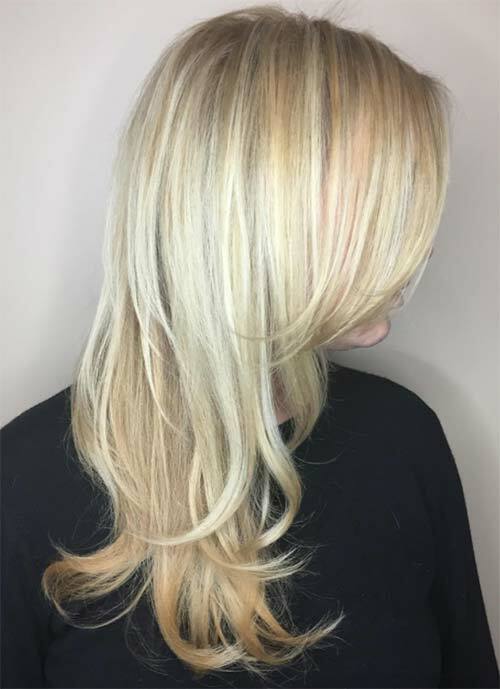 This is a wispy take on long layered haircuts, with ultra feathery waves and a really bright shade of nearly white blonde. The layers start right at the chin, framing the face really beautifully. 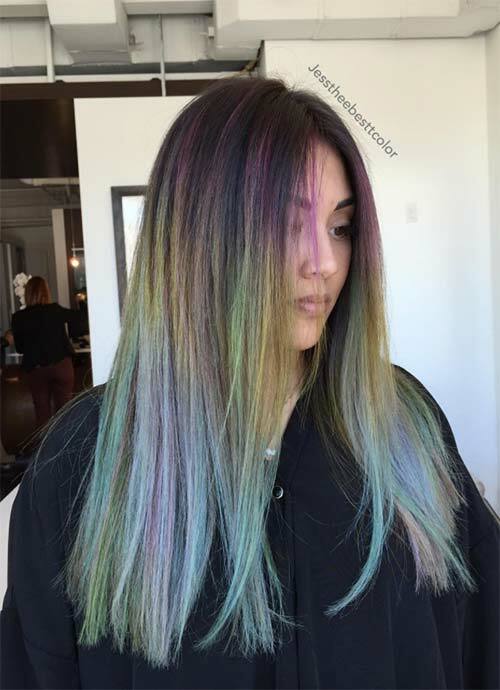 The effect of this rainbow balayage on the straightened hair really looks like denim. This shows how well a few wispy layers near the face can work, even when the hair is dyed a crazy color and straightened. 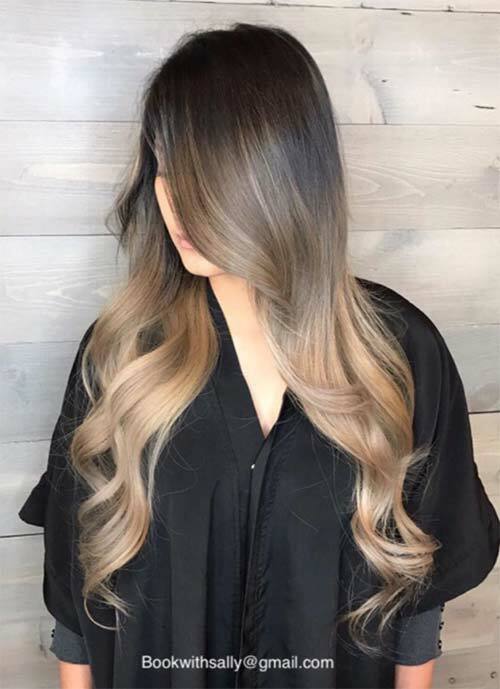 This is another one of those long layered hairstyles where the difference between the shortest and longest layers really stands out. 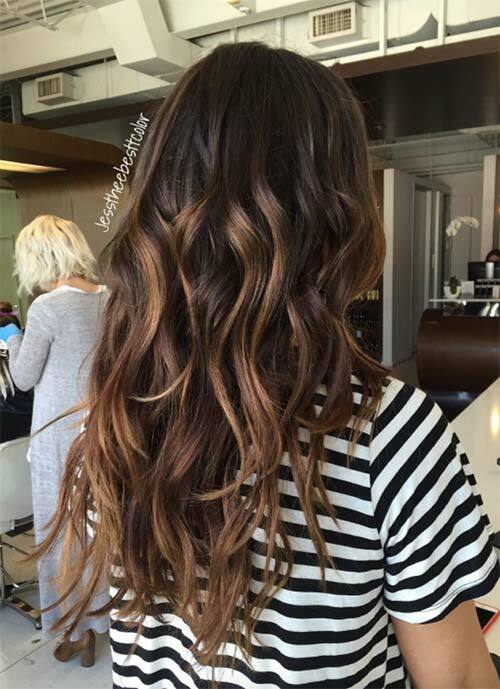 Dark brown and caramel shades are complemented nicely by the layers and waves. Beach season might be over, but don’t let your hair betray that fact! 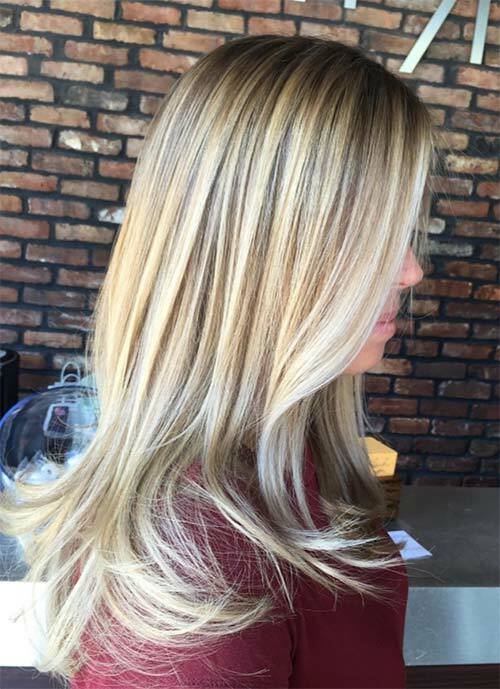 Gorgeous textured long layered hair is emphasized here by the bright blonde highlights that create the illusion of volume right in the center. 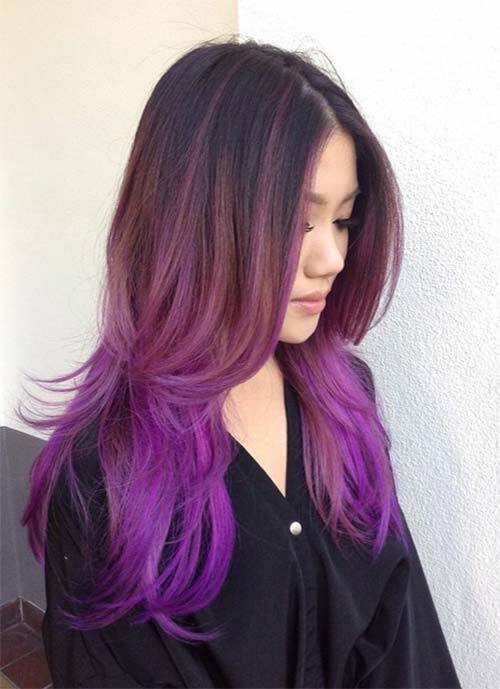 This striking violet, lavender, and blonde balayage is a softer take on long layered hair. The gently blow-dried layers begin right below the shoulder, lending a subtle touch of structure. These autumn colors look like they’ve been perfectly windswept, thanks to waved strands that are all twisted in the same direction. It’s a striking and seasonal take on the long layered haircuts. 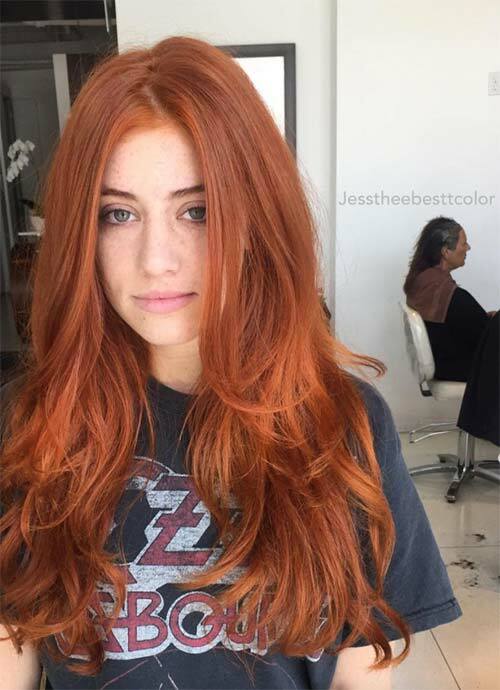 When long layered haircuts feature a lot of longer and shorter layers, that is when maximum volume can be achieved, like on this redheaded bombshell with wavy hair. 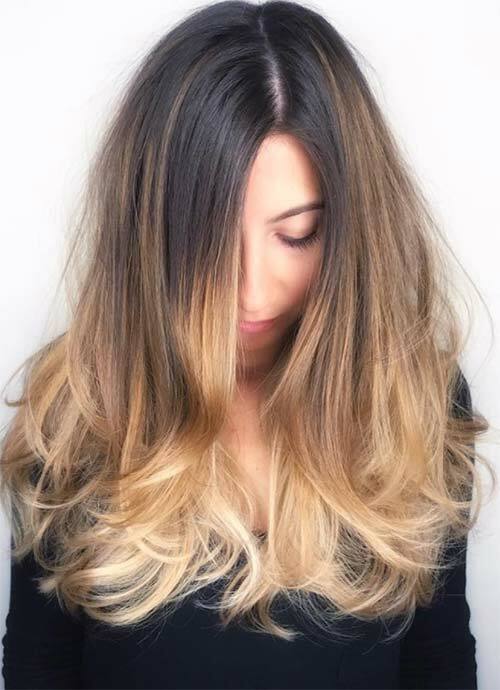 This long layered hair shows us an example of how the layers can bring out the contrast in a beautiful balayage or ombre. The layers here start right at the transition shade from the dark roots to the bright ends. Perfect for autumn, the face-framing layers look positively windswept and gorgeous. 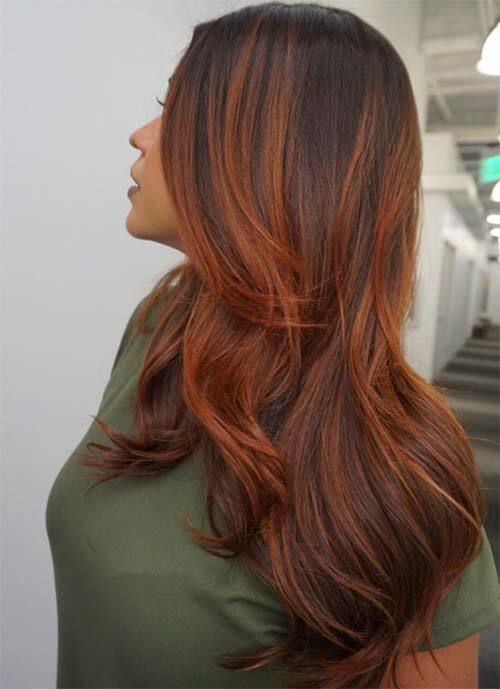 Shades of chocolate brown and pumpkin orange are a delicious combination with long layered haircuts. 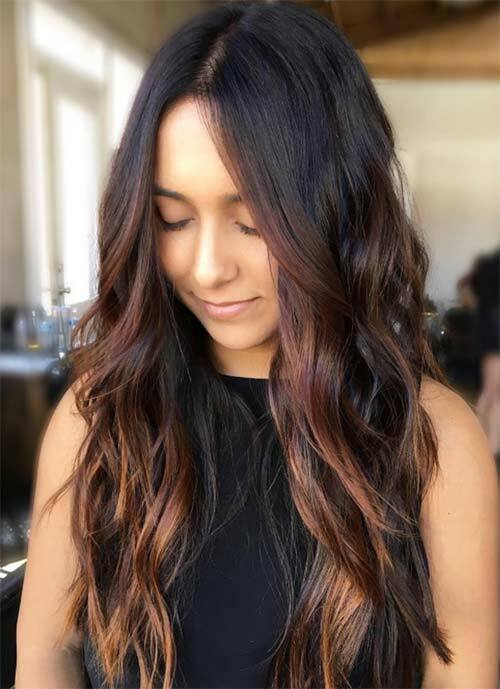 Lovely, textured waves work perfectly with long layered haircuts, like in this lovely chocolate brown look. A few softer brown strands along the ends of the hair add a touch of brightness and joy. 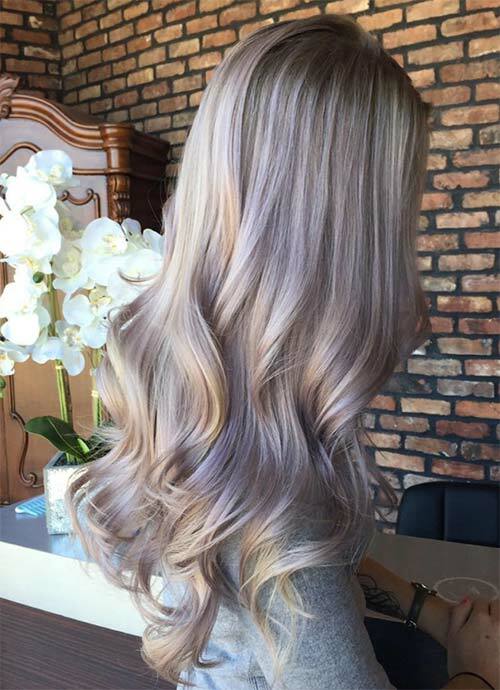 Okay, so maybe those are blonde layers, but they are so cool and glowy they seem like silver! Ultra long layered hair can be beautiful, especially when a few shorter layers make things interesting. This long layered hair looks super soft and thick thanks to a few shorter layers all around the crown. Additionally the contrast between the darker crown and bright caramel rest of the hair also creates a lot of depth. 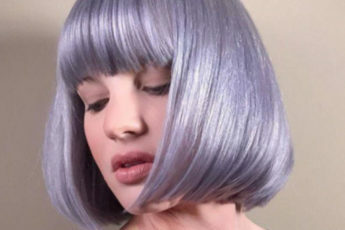 These soft metallics are a total hit this year, so why not pair them with long layered haircuts? Ultra long hair with a ton of wispy waved layers is totally striking. 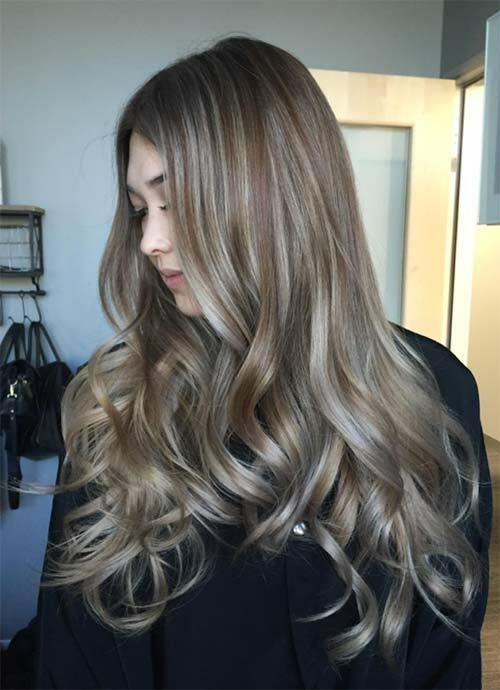 This gorgeous warm, metallic balayage is totally boosted by the super voluminous curled ends. 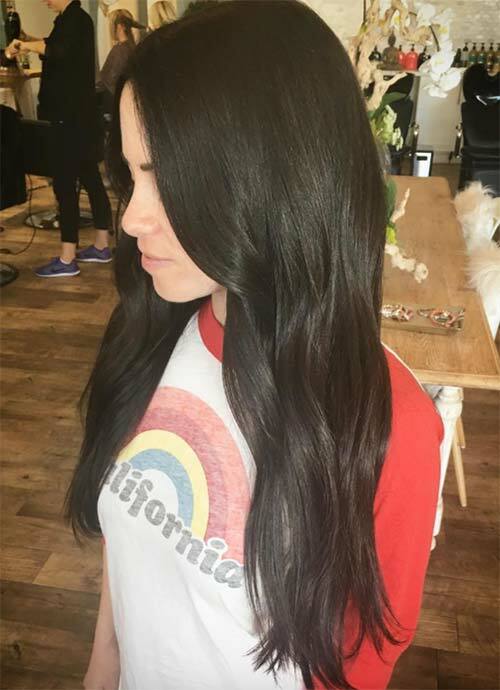 This long layered hair is extremely layered at the ends, making the length of the hair really stand out. 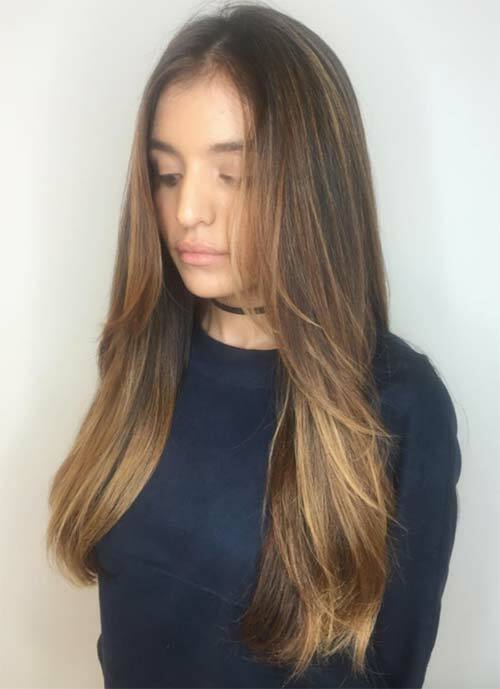 This lush balayage long layered hair is especially thick and soft looking, thanks to feathery layers and waves. Bottle neck curls, like with this astounding gradient, are the perfect complement to long layered hairstyles. They have a romantic, old timey feel, and they amp up the volume that the layers already give to the hair. 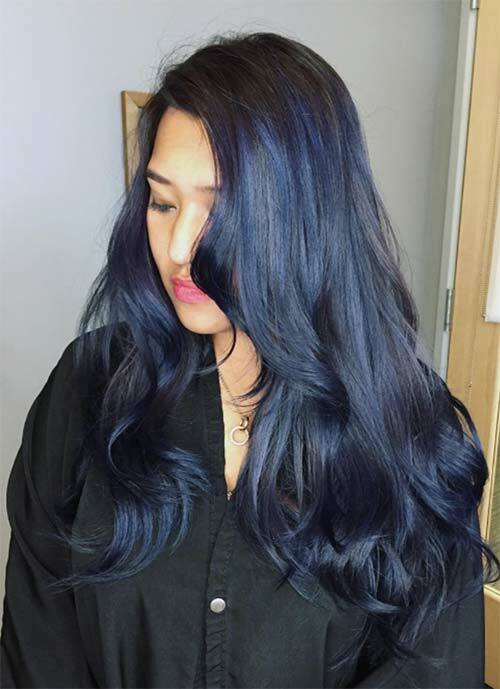 The same long layered hairstyles that can seem so fun and windswept become magically dark and mysterious with smoother styling, and a midnight blue dark shade like in this picture. 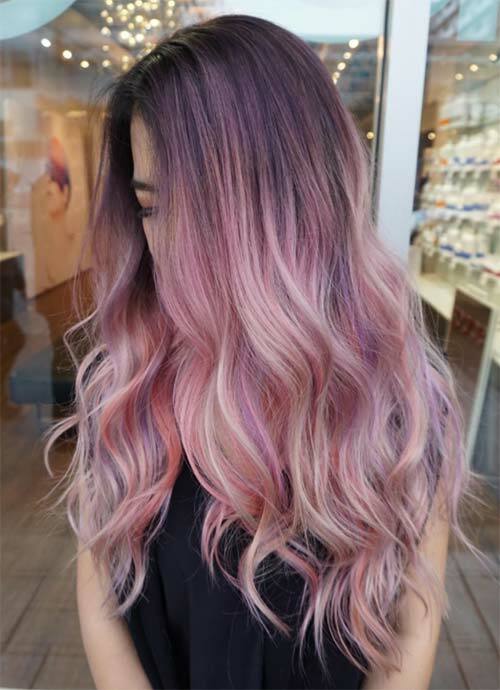 The gently tousled waves in the bottom half of this high-contrast balayage really accentuate the cotton candy effect. It’s a fun yet dramatic take on long layered hairstyles. This lovely golden brown sombre is also a perfect example of very subtle layering just along the ends. This long layered hair seems evenly cut, but just a little more interesting. 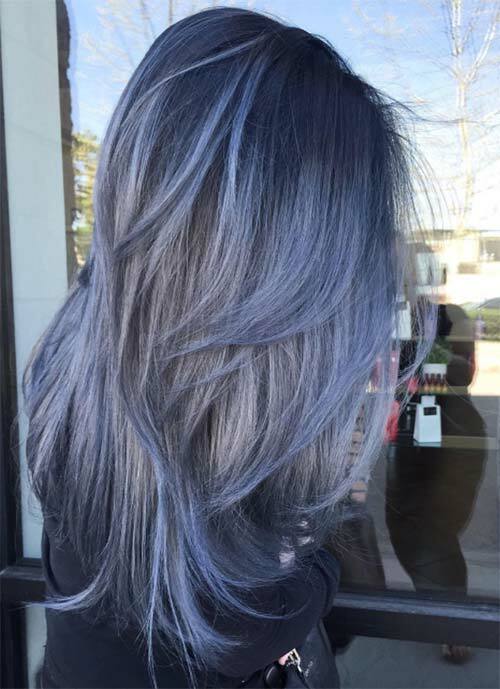 Denim hair is another recent trend that pairs beautifully with long layered hair. Super sleek waves at different lengths really play up the texture of the mixture of blue and black dyes. This long layered hair has a bit of a ’70s vibe, thanks to really short layers that reach just the top of the cheekbones. They’re an excellent way to frame and soften the face, and they make the hair much more unique. 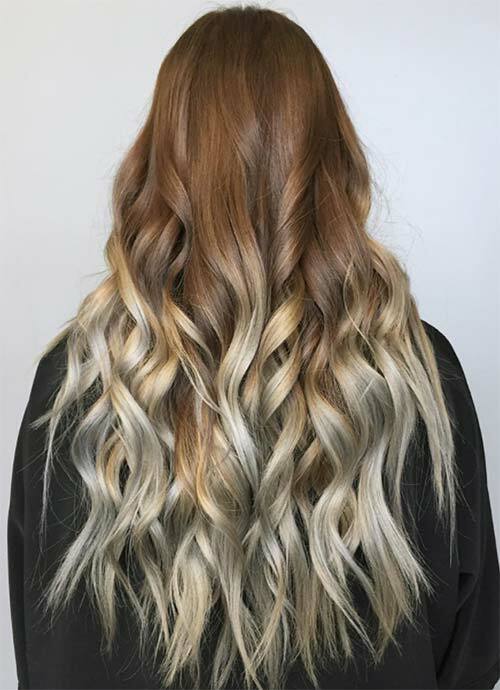 Paired with soft platinum waves and darker roots, this look is light and stylish. 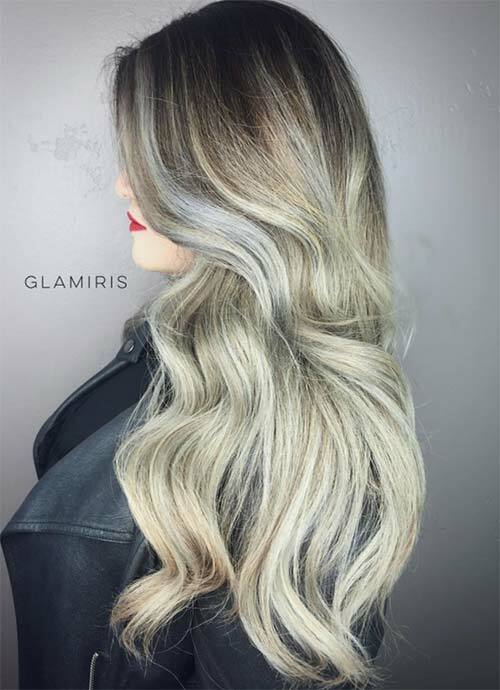 This charcoal shade of long layered hair is uncommon, but it is a totally breathtaking take on darker hair colors. The gentle, wavy layers start a bit below the shoulder, for a luxurious, voluminous look. Like an astounding jewel, shades of silver and garnet come together in this marvelous take on long layered haircuts. 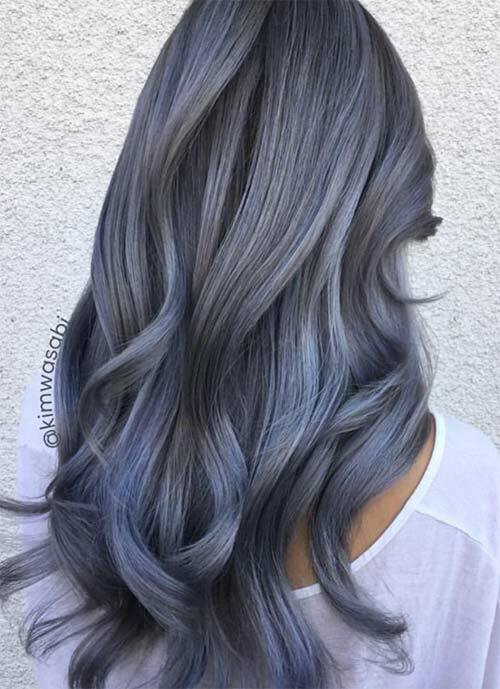 The length difference between the various layers is not too drastic, so the effect stands out the most along the purple tipped edges of this silver hair. Layered haircuts of long hair pair really well with really textured waves that seem almost as though they are alive. The different layers are extra unique, thanks to the drastic length difference, and the dark black shade is intoxicating. This sapphire to platinum color melt is rich and seductive. 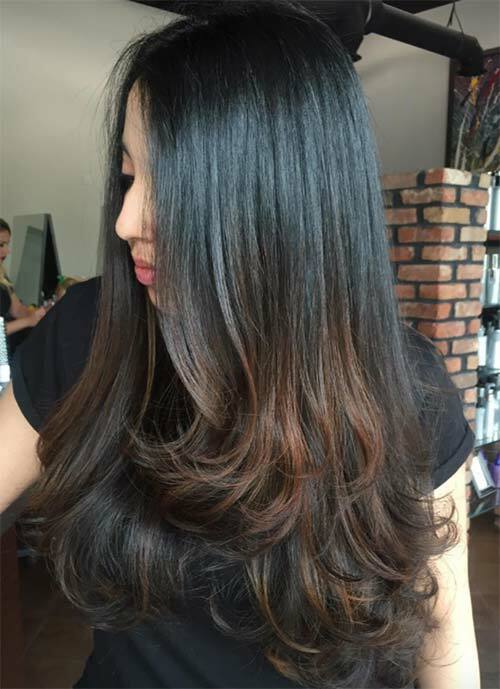 The long layered hair matches the color gradient, by gradually becoming longer. This dramatic dark to blonde sombre really stands out because of the switch from cool roots to warm ends. The hair is mostly straight, but tousled, which makes the coloring even more striking. A few cheeky layers, especially near the face, complete this look. 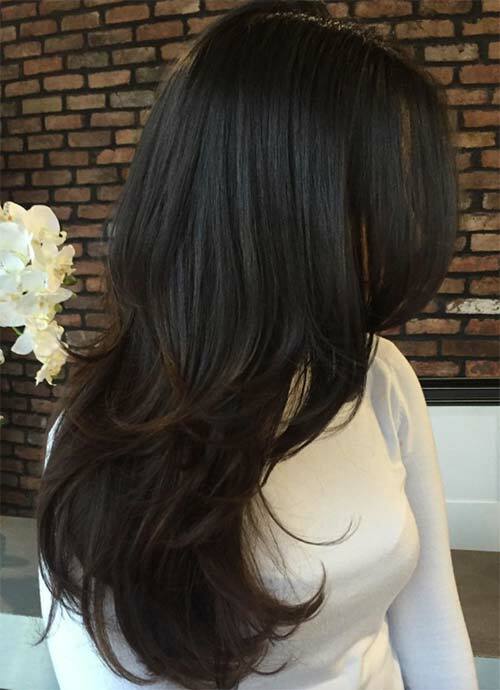 This is another example of long layered hairstyles where shorter layers at the front help frame the face, and add a bit of weightiness just below the shoulder. A bit of loose curing pairs well with the autumnal gold and copper balayage. 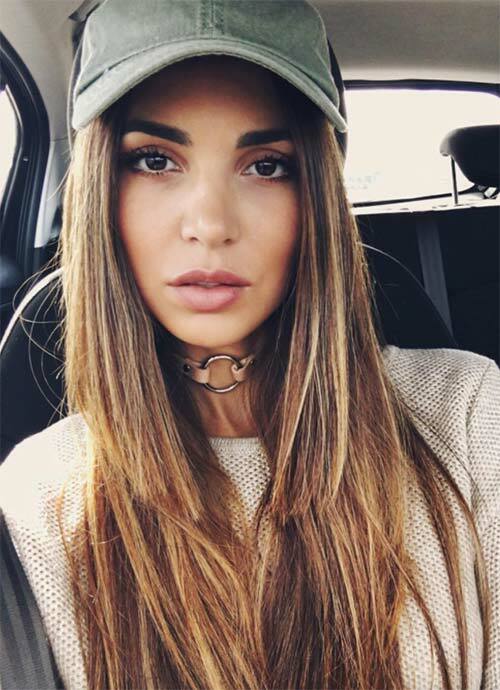 In this long layered hair, we see the strands near the face ending right at the chin, while the rest of the hair drops down to end considerably lower, creating a more casual look that with a few pins could become “faux banged’. 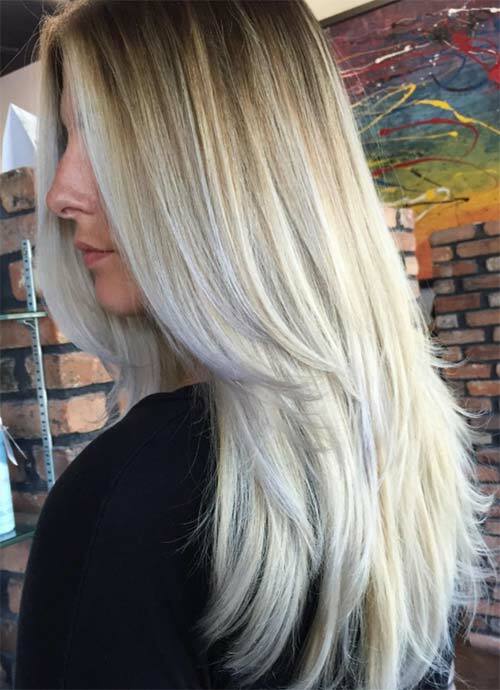 The lovely dark roots and warm blonde hair are perfect with the layers and loose waves. 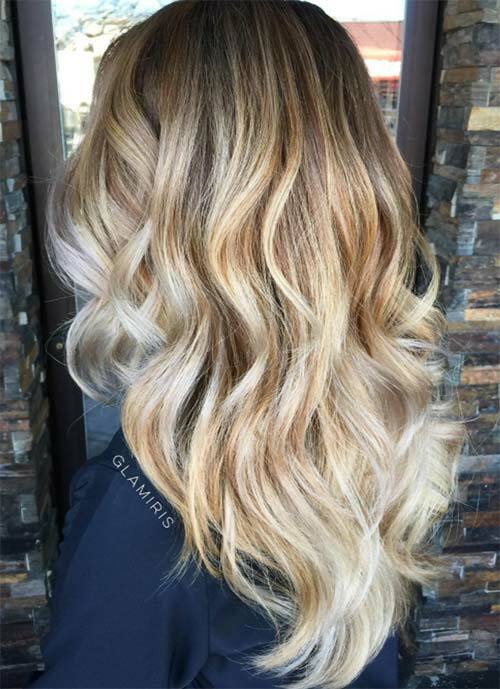 I can’t decide if the winning element of this long layered haircut is the large and luxurious curling, or the subtle touch of blonde that runs through the brown strands. Either way, this hair doesn’t only look touchable, but also it looks like something you could submerge yourself in. Cleverly constructed long layered hairstyles can also take on interesting shapes, especially when the hair is extremely long. As the hair is gradually layered, the ends become thinner, ending in really delicate and lovely curls. The volume in this cut begins right at the shoulders, along with the shortest layers and the transition to blonde hair. 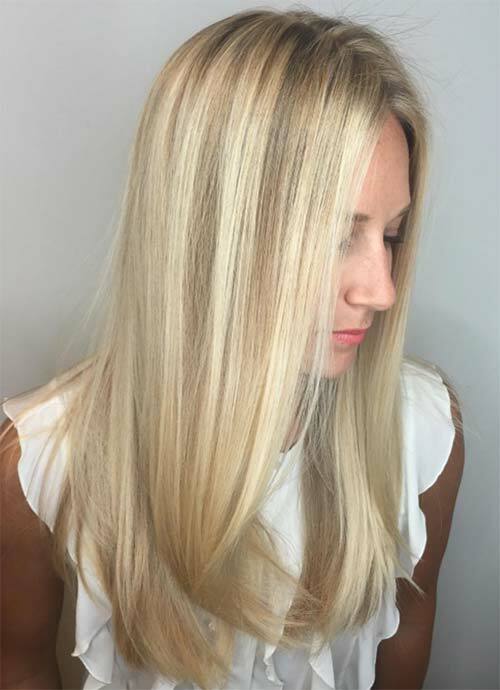 This straightened long layered hair is a sleek and modern take, especially because the balayage stands out more clearly. The layering here was mostly kept to the ends. While some long layered haircuts look full and heavy, others can look airy and weightless. Here, the soft layers along with the light highlighting make for a breezy and soft look. This long layered hair has every ounce of thickness and lushness as a non-layered cut. Thick waves of impossibly dark hair flow beautifully. Warm blonde colors and long layered hairstyles are a match made in California heaven. 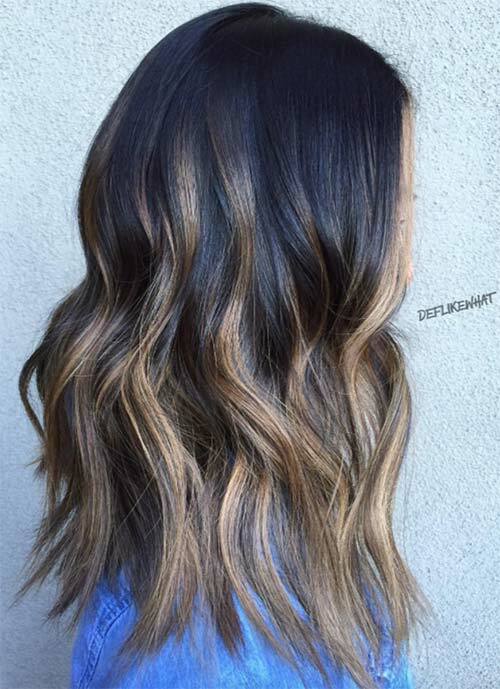 This lightly layered balayage is begging for some beach time. This is the very definition of blonde hair ” bright, sunny, and even. Just a touch of layering in this cut is subtle, and blends well with the straightened hair. 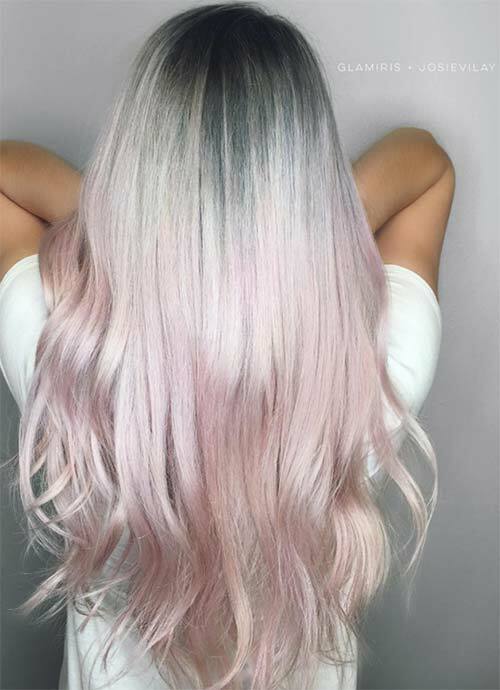 This is perfect unicorn mermaid fairy princess hair ” long, healthy, shiny, and PINK! This classically wavy styling lends itself well to long layered hairstyles. This long layered hair looks as though a batch of silver jewels had been melted and then poured unto the head of a goddess. Perfect curls look extra voluminous thanks to a touch of layering at the ends. Whereas the previous long layered hair was all about the silver, this is some golden magic! The waves are warm and healthy, and the layering is gentle and exquisite. Running a few golden streaks through select strands of hair, especially near the face, is the perfect way to warm up brown hair. 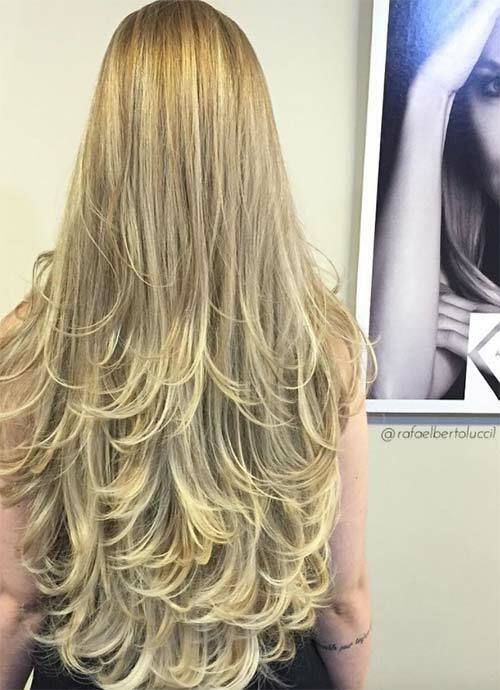 This super long hair looks soft, textured, and healthy thanks to perfect gradual layering. 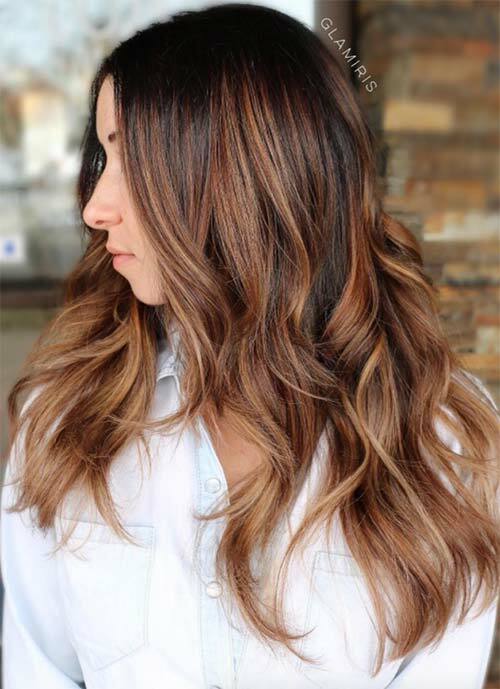 This caramel balayage is also an edgier take on long layered haircuts. 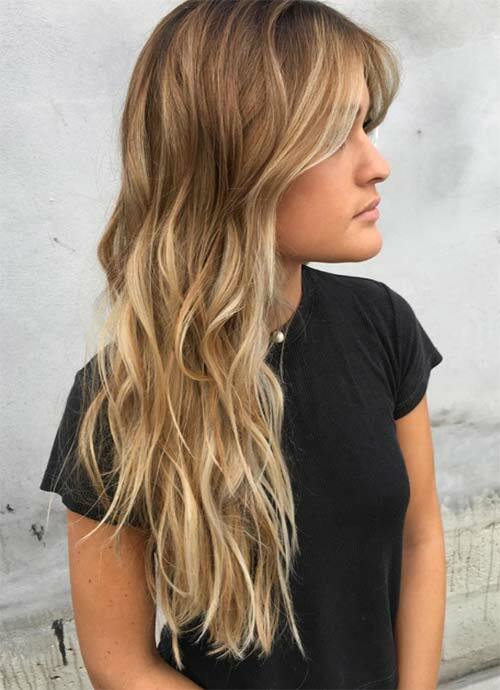 The shorter layers come in right at the shoulder, while the rest of the hair ends just above the elbow, creating a dramatic and messy effect that is softened by the lovely waves. 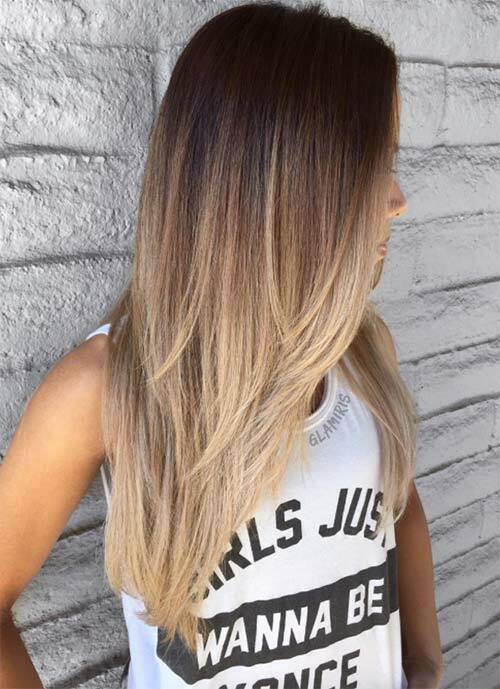 This luxurious ash blonde ombre is also an example of graduated long layered haircuts. 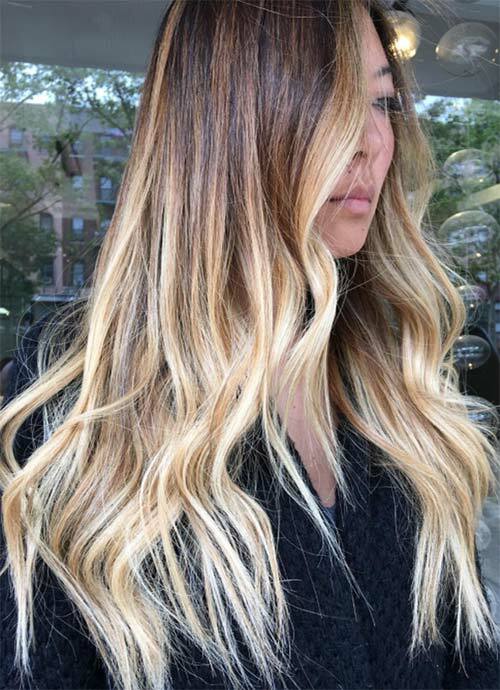 Near the front, the layers get gradually longer, creating a smooth line and a glamorous effect. 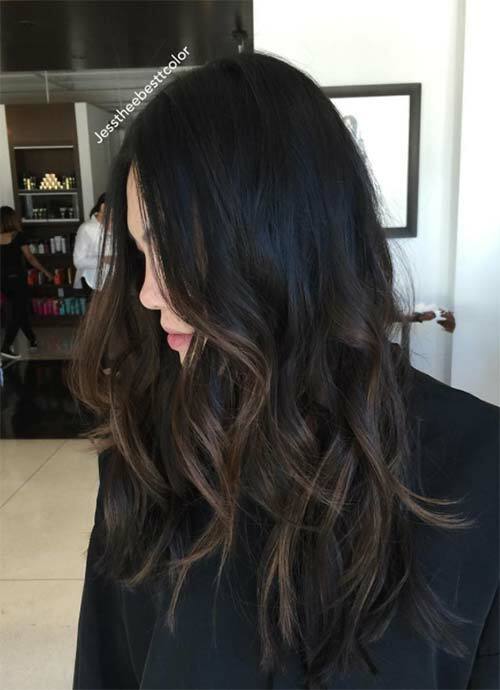 Dark black to caramel balayage is an autumn classic. This is a lovely example of medium long layered hairstyles, with textured waves. 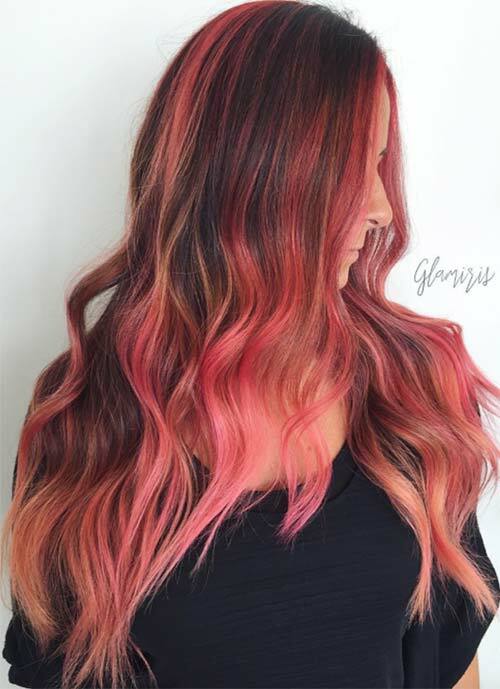 Gorgeous shades of apricot, pink grapefruit, and pomegranate are delicious and refreshing in this gorgeous balayage long layered hairstyle. The layers seem totally organic, starting fairly low below the shoulder. There is something about curly golden waves that is completely summery. Along with gentle long layered hair, and a dynamic balayage, this style is a winner. 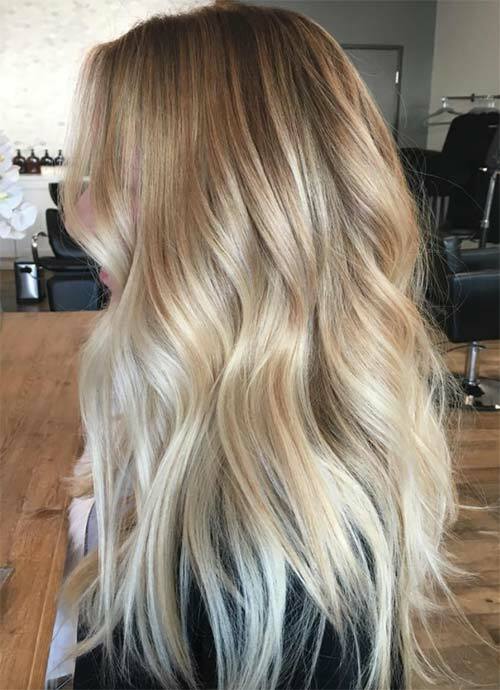 Brilliantly blonde balayage, brilliantly chosen strands for layering, and thickness and length that are totally to die for! In this longer layered hairstyle, the ends seem super textured because of the layering all throughout the cut. Flecks of caramel run through the chocolate brown, adding a lot of dimension. Long layered haircuts with face-framing strands, lots of waves, and lots of warmth are universally flattering. Gentle waving, and a few shorter layers along the crown really texture things up. This is perfect long layered hair for an ocean babe. 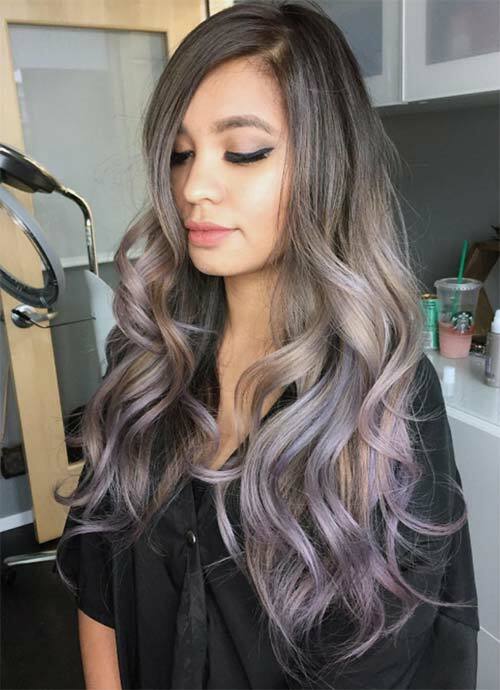 This silver and lavender balayage is gently layered above the shoulders and at the ends, and it looks flawless. Feathery layering near the front is an excellent way of emphasizing lightened hair, like in this shining example of layered haircuts of long hair. The ends were lightly mussed to emphasize the breezy layering. 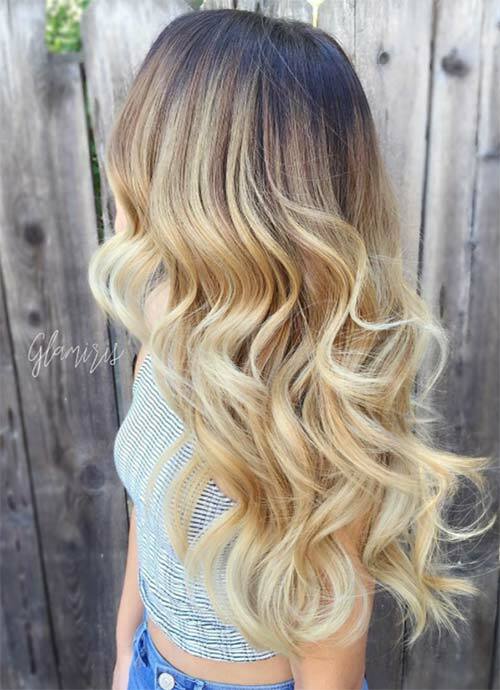 The sandy gold shades of this balayage blend perfect with a spritz of salt spray that adds a ton of texture. The long layered hair is a little messy, which blends exceptionally with the rest of this look. This is a subtle, two layered version of long layered haircuts. The ends look as though there are two parts to this cut, with a longer inner layer and shorter outer layer ” super flattering, and very interesting. This is another look, where the layering was focused on the ends of the hair. 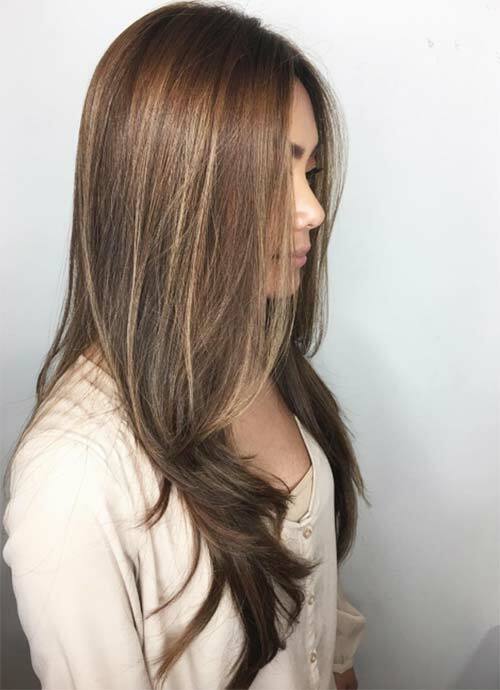 In this gorgeous golden brown balayage, however, the layers are thicker, and more suited for a lush, voluminous look. I absolutely adore this shade of honey gold! It pairs beautifully with the blown out face-framing shorter layers that have a classic ’70s vibe. 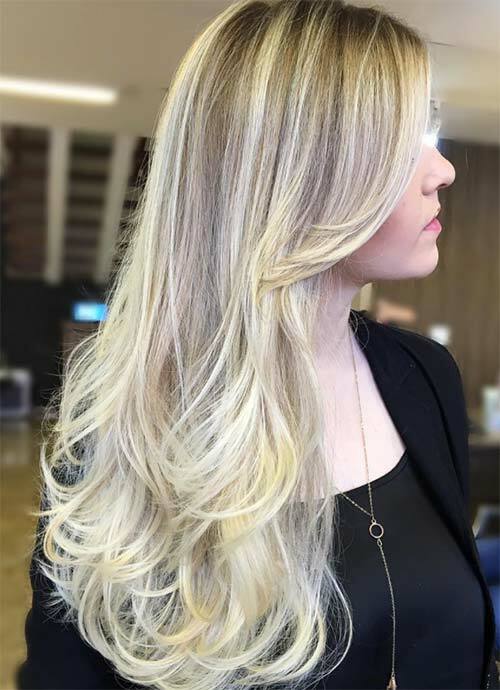 This long layered hair is a really cool example of how well combining cool blondes and warm blondes can work. The shorter layers near the face, along with subtler layering near the ends help with the seamless color blending. This is a cheekier take on long layered haircuts, thanks to some really short layers that give us just a hint of a bang. They frame the face beautifully, while the rest of the layers create a lovely line, as they get progressively longer. Streaks of caramel through the chocolate brown hair, along with a touch of volume at the crown, make for a classy look that really stands out. Channel your inner Queen Elsa with this gorgeous long layered hair. 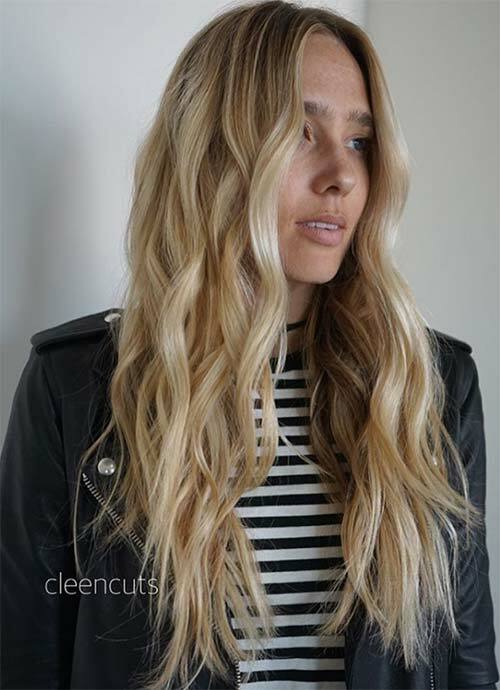 Cool blonde waves and texture-building layering at the shoulder make for a haircut that could melt ice. 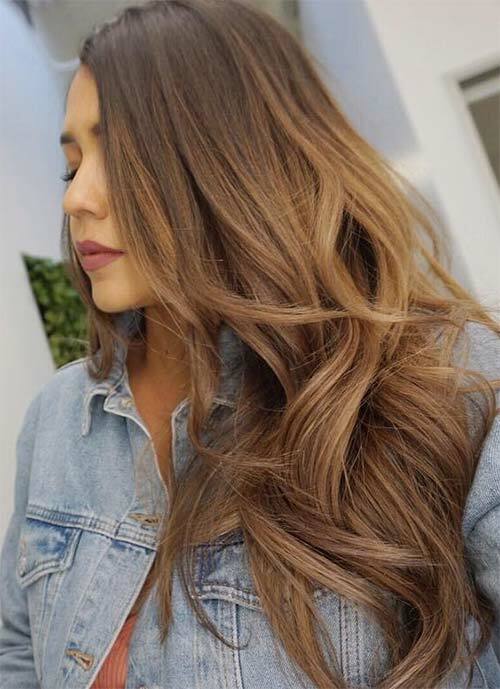 This perfectly waved long layered hair radiates health and luxury, thanks to a shiny finish, and lots of volume enhancing layers at different lengths. 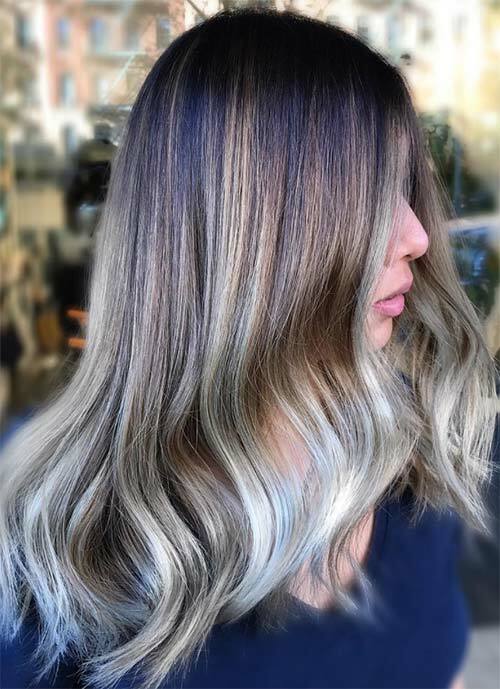 The unique warm gold and cool ash brown color combination really stands out to me in this take on long layered haircuts. The layers themselves are primarily near the front of the cut, framing the face and looking sleek. 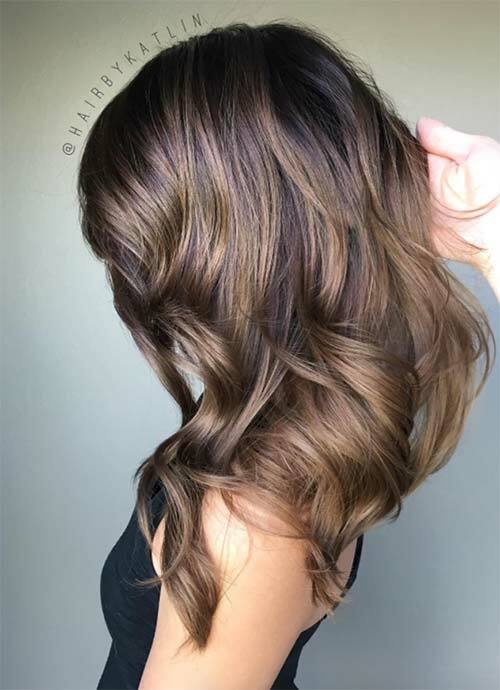 This is another take on chocolate brown layered hairstyles, but this time the layers are a little sharper, and the waves are a little more piecey. There is nothing like a hint of reddish orange to bring to mind the autumn season, especially when coupled with cascading wavy layers that manage to gorgeously represent the falling leaves. As this picture shows, long layered haircuts lend themselves fabulously to chic messy styling. With this kind of layering, you don’t always have to worry about keeping your hair combed. The fun thing about long layered haircuts where the layering is concentrated at the ends is that you can really play up an ombre coloring. The effect here is of sunny clouds, thanks to the added volume. 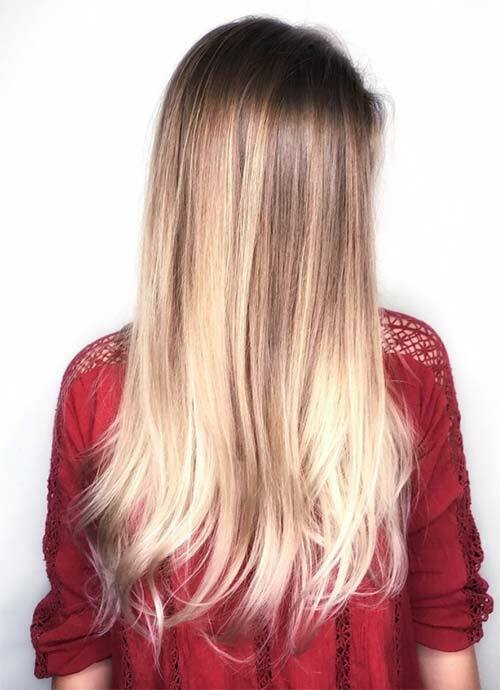 This long layered hair features lots of summery highlights, but with easy to maintain dark roots, and the most luxurious and healthy looking ends thanks to lovely layering. Some long layered hairstyles are so long, so glossy, and so wavy that they are totally ocean ready. 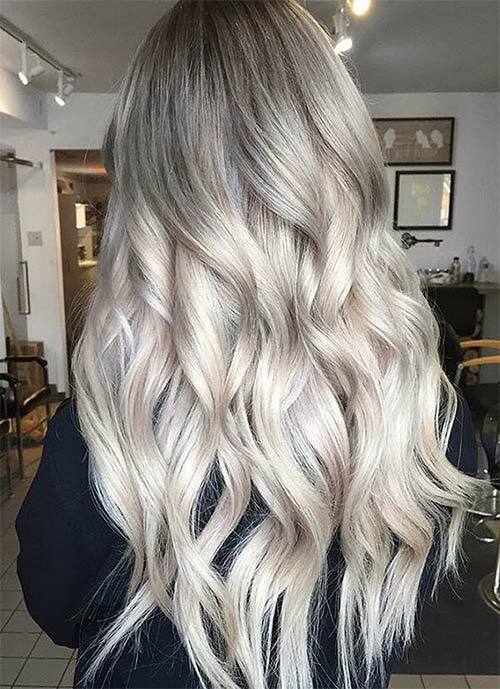 These gorgeous platinum waves are extra wild thanks to an array of layers that add dimension and body. 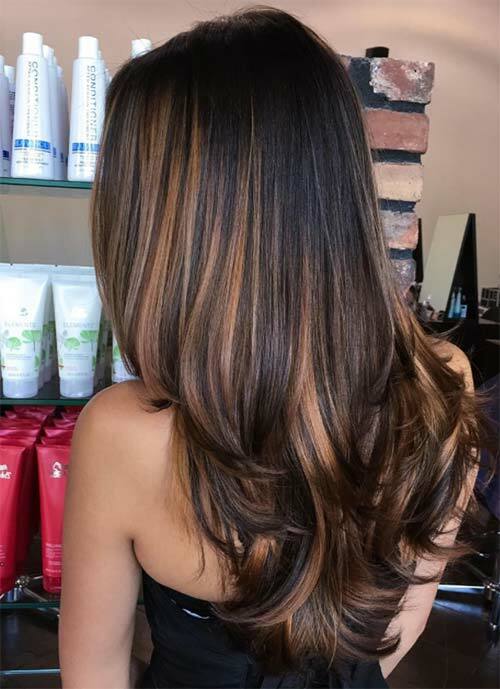 There are three examples of layering in this marvelous balayage cut. We have some face-framing layers right below the chin, and then two layers of strands creating interest right below the shoulders, all around the head. Thanks to the blowout, this whole look is breezy and light. 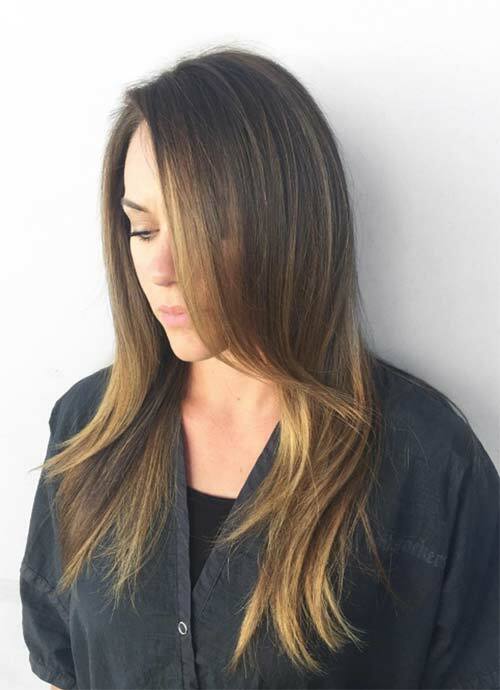 This gorgeous brown and blonde balayage is made extra mysterious thanks to the side bangs. The rest of the cut is an example of long layered hairstyles where the layering is concentrated at the ends. 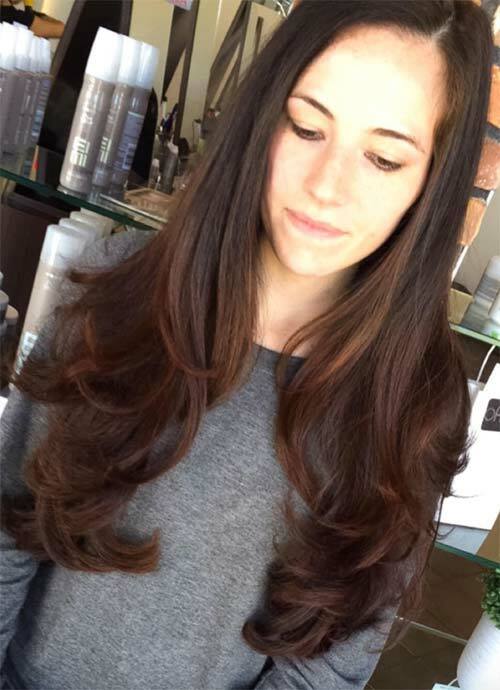 Here we see face-framing layers, cool sandy shades, and just a hint of a wave in this incredible long layered hair. There is something about the long layered hair just gently blow-dried that is glamorous in the most understated way. I love the way the bangs blend into the layers near the face, and the extra touch of layering just at the shoulders. 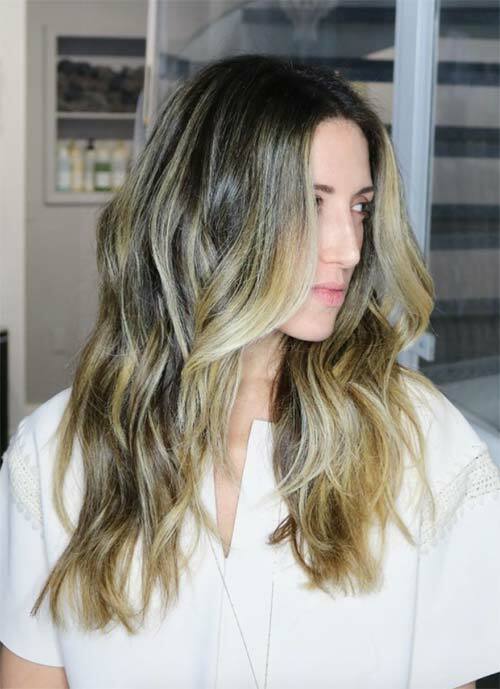 This is an easy-to-wear and universally flattering layered haircut for long hair that looks so youthful and fresh, especially thanks to the soft hand-painted balayage that looks like natural. We are finishing this list of long layered hairstyles with a blonde bang! Or maybe a bangin’ blonde? 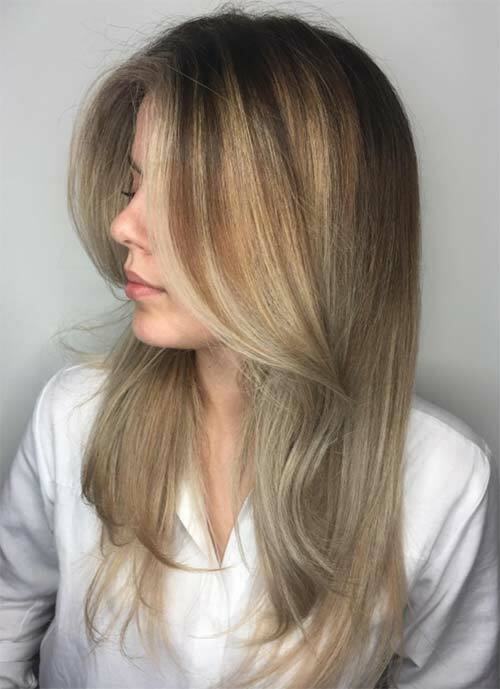 Either way, this is a lovely blonde streaked layered haircut, with just a bit of two-lever layering to add volume near the ends. Love it! What’s your favorite take on long layered haircuts and styles? Let us know in the comments!